You'll explore the less-touristy side of things at Praia Ponta de Mangue and Burgalhau Beach. Venture out of the city with trips to Tamandare (Nova Matriz de Sao Pedro & Praia de Tamandare), Japaratinga Beach (in Japaratinga) and Maragogi (Zoologico Pet Silvestre & Peroba Beach). 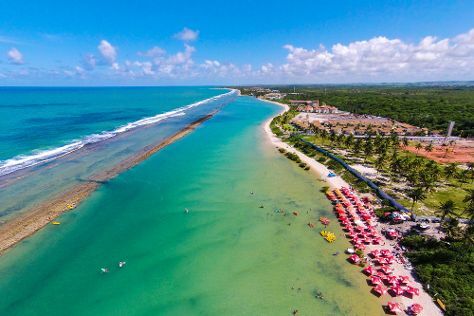 There's still lots to do: tour the pleasant surroundings at Muro Alto Beach, enjoy the sand and surf at Pontal de Maracaipe, sample the fine beverages at Cachacaria e Pimentaria Tio Gilson, and look for all kinds of wild species at Natural Pools of Porto de Galinhas. Planning Porto de Galinhas trip won't be overwheling when you use's Insprock itinerary maker. Use the Route module to find travel options from your starting location to Porto de Galinhas. In March, daily temperatures in Porto de Galinhas can reach 35°C, while at night they dip to 29°C. Wrap up your sightseeing on the 15th (Fri) early enough to travel to Fernando de Noronha. Kick off your visit on the 16th (Sat): take in the architecture and atmosphere at Capela de Sao Pedro, enjoy the sand and surf at Ponta das Caracas, and then stroll through Praia do Sueste. Here are some ideas for day two: take in panoramic vistas at Forte Sao Pedro do Boldro, enjoy the sand and surf at Praia do Cacimba do Padre, and then kick back and relax at Baia do Sancho. You can do a combination of shuttle and flight from Porto de Galinhas to Fernando de Noronha in 3.5 hours. The time zone difference when traveling from Porto de Galinhas to Fernando de Noronha is 1 hour. 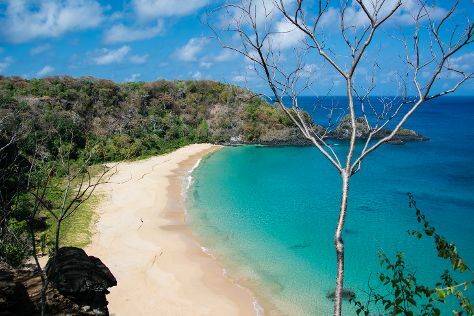 In March in Fernando de Noronha, expect temperatures between 35°C during the day and 29°C at night. On the 18th (Mon), wrap the sightseeing up by early afternoon so you can travel back home.